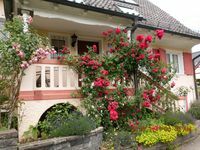 Properties in Au Heerbrugg Station average 4.7 out of 5 stars. Property 8: A chalet on delightful, vineyard covered hills, suitable for 2 people. Holidays only with a dog! 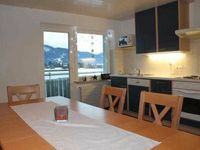 Property 42: Holidays only with a dog! High-quality new building, handicapped friendly, large balcony, view of the Alps. Property 44: High-quality new building, handicapped friendly, large balcony, view of the Alps. Hanna is a very good host. She answered my many questions promptly. Very charming apartment and kitchen is well stocked. Washing machine is very convenient. Bed and linens are so comfortable . Good location near the sea and central to other sights in the area. There is a grocery store, several restaurants, bakeries, and other shops within walking distance. Would definitely stay here again! Great place and great hosts. Highly recommend this as a place to stay. Ski sopes at mellau are about 20 minutes drive. There are some buses but I would recommend a car. The appartment has everything you need and it is like a home from home. Kids toys and some books are a really nice touch. Lots of local information and the WIFI is great..